AP Redesigns its iOS App, Adds "Big Stories"
The Associated Press (AP) is well known for breaking news worldwide, and today it has released an updated version of its AP Mobile app for iOS with a brand new interface and even more news than before. The new app is a universal build which will work with all iOS devices, including a larger screen version specifically for the iPad. Among the new features are something the AP calls “Big Stories” which is a category of news that seems very similar to Twitter’s new “Stories” feature, meaning you’ll be able to view news by type depending on how popular or “big” the topic is. Along with Big Stories, the AP has revamped its presentation of local news, now providing you with more news sources and stories in your area. • New look and feel. Innovative redesigned layout with improved navigation, more compelling AP content, and new features. Now a consistent experience across devices. • Big Stories. 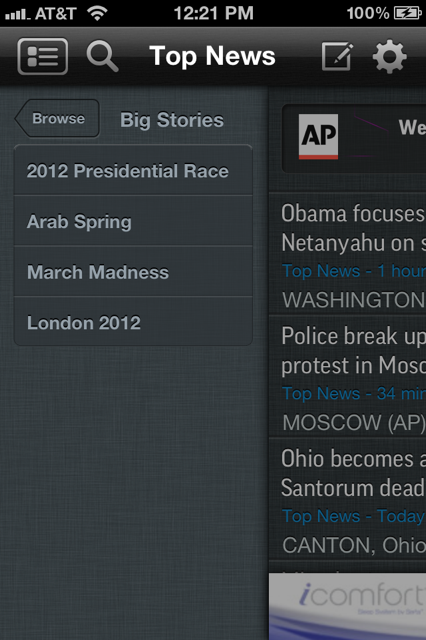 AP Mobile brings all content related to captivating stories together in one place with the new Big Stories feature. Follow major in depth stories, with separate showcases for photo and video, interactive graphics, and integration with social media. • Each category page now has a photo and video ribbon so can get a taste of the best photos and videos of the day. • My AP. Customize which news categories show up in your feed. • Local News. Stay in the loop with local coverage from over 1,000 local newspapers, now with content separated by publisher available in your area! • Breaking News on Your Mobile Device. Get breaking U.S. and International news from the AP, the world’s trusted news source. • Award Winning Content. See more of what the AP has to offer with more references and links to more AP content through an innovative contextual area in each category. • Social Media Integration. Share your favorite content through Facebook, Twitter or email with the single tap of your finger with much more to come. • Send a News Tip to AP. 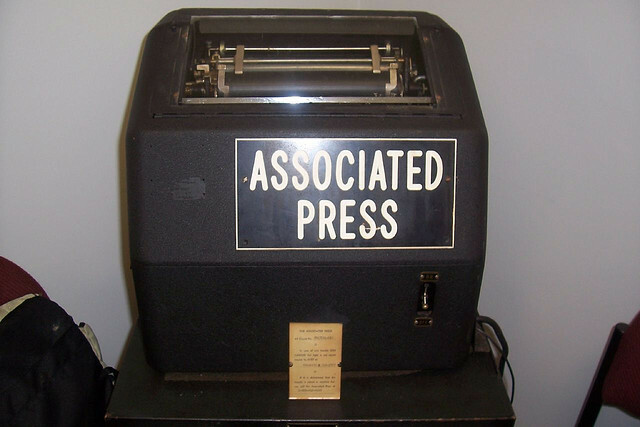 Have a news idea or breaking story that you think AP would be interested in? Let AP know by tapping the Send a News Tip button in the top right corner of the page. • Photos. Easily browse AP’s award-winning photos in a completely redesigned photo section. • Videos. View AP’s exciting video content in the new video player. Now including LIVE video for AP covered events such as red carpet events and more! • Customization. Change the look of the app to suit your viewing preference. The new AP Mobile allows you to customize the background and also adjust font size for easier reading. • Feature Request. If you have a feature that you would like to see on AP Mobile, notify the AP Mobile team via the Feature Request button in the Settings tab. • Press Releases. Browse international and national press releases to keep up with events via the press wires. Along with the new navigation, the AP is putting more focus on multimedia content by making its photos and videos tappable and shareable, as well as introducing live feeds into the mix. 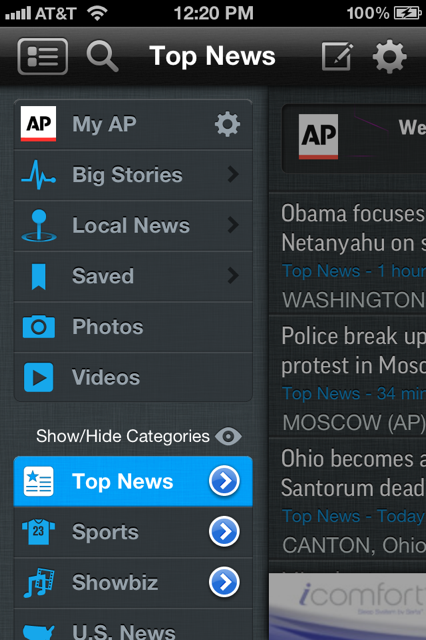 AP Mobile is now the most robust and easy-to-navigate app for news. That’s a pretty bold statement, but we have to agree that this new version of the AP app is chock full of content and is designed in a way that is easy to navigate. At no point are you over-run with lists of headlines like you are on the AP website, which is a huge plus for reading news on your mobile device.